One in four of the population of Lebanon is now a Syrian refugee. If the UK had received the same proportion, there would be 16 million. The reference of course is to mezze, the variety of small dishes to be consumed in leisurely fashion over conversation that is familiar throughout the Eastern Mediterranean. It’s a familiar approach at the burgeoning number of Turkish restaurants around Leicester. Can I give you chapter and verse on how precisely Lebanese mezze differs from the Anatolian style? To be honest, no. But what I can say is that the mezze at Cedars stands up well to similar offerings around the city. In fact I’d say there’s a wider range of flavours on offer here and they pack a bigger punch. A lunchtime visit for the mixed mezze platter for £7.50 featured some excellent food with a pleasing variety of textures and flavours. Should you be on your own, this is definitely the way to sample the range on offer. 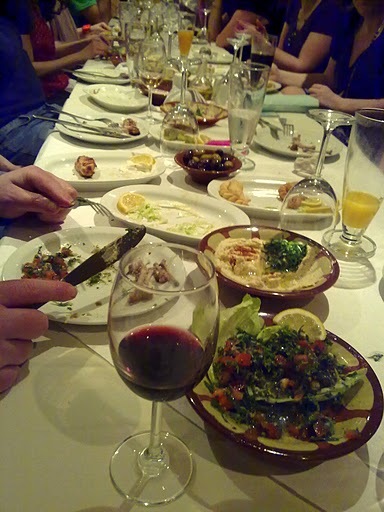 It features eight items from smooth, nutty hummus drizzled with good quality olive oil through to savoury filled pastries such as sambousek, stuffed with delicous minced lamb given a sweetish edge with a hint of cinnamon and fattayer, an oven-baked filo pastry with sharp minerally spinach, onion, lemon juice and pine nuts. More sweetly spiced lamb was contained in kebbeh, a little parcel wrapped in bulgur wheat and deep-fried, and there was more sharpness from the parsley, onion and tomato salad tabouleh and from vine leaf rolls filled with rice and herbs with lemon juice. Probably the only element I didn’t really warm to was the moutabel, grilled aubergine puréed with sesame paste, lemon juice and garlic. Despite a sprinkling of sumac this was a bit bland and I wasn’t keen on the “scrambled egg” texture. On a quiet lunchtime the relentless Europop was a bit of an irritant and the staff were busy rearranging the back part of the restaurant rather than paying much attention to me, but the food definitely warranted a follow up. Our self-selected mezze at an evening visit was even more impressive. Superbly grilled chicken wings came with French-influenced aioli – a powerful paste of whipped-up garlic and olive oil. We also loved the foul medames, tender broad beans and chickpeas with lemon juice and garlic, and the feisty sujuk, densely meaty little sausages in a mild chilli and tomato sauce. We shared one main course too, a mountainous mixed sharwama, with piles of spiced, sliced and roasted lamb and chicken along with rice, salad, pickles and flatbread. The spicing dominated the flavour of the lamb somewhat but this was all good flavoursome stuff. Unlike the majority of the new breed of Turkish restaurant, Cedars is licensed and has a fairly extensive Lebanese wine list, including the divine Chateau Musar. On this occasion we limited ourselves to a Lebanese pilsener, a mite sweet to my taste but good to try. We wrapped things up with refreshing mint tea and some nutty pastries. I would imagine Churchgate must have it challenges when running a restaurant but Cedars has survived a good few years now. I can see why and it deserves to be far busier than it was on our visits. 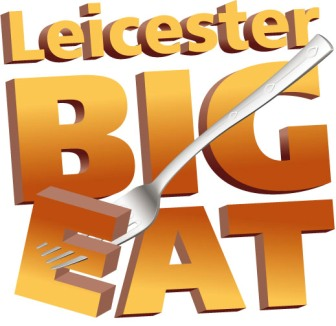 Good news that the One Leicester campaign has revived its Big Eat initiative that sees many if not most of the City centre’s restaurants run two-for-one type special offers on the same evening. Last year it brought full tables and something of a buzz to the whole city city centre. This year it’s been brought forward to coincide with the Leicester, sorry, Dave’s Leicester Festival so there’s every reason to combine the two for a cracking night out. Most of the restuarants require advance booking for the offers and the precise offer does vary so you’ll need to check on the website One Leicester. Among the most interesting are two for one main courses at Kayal (when ordering two courses), two for one on a special menu and live Indian music at Chutney Ivy and 30 per cent off the food bill at Cedars Lebenese (plus belly dancing). Many of the chains, independent restaurants and cafes are also running offers. If you are still swithering then its worth bearing in mind that there will be free parking at the Newarke Street, Haymarket and Dover Street car parks after 6pm. 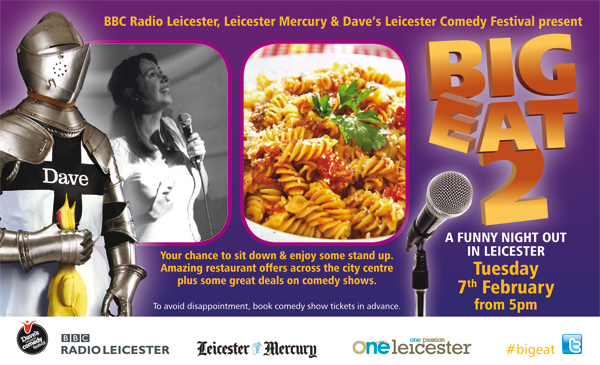 I’ve somehow seemed to miss out on the early publicity for this, but Leicester’s Big Eat looks like a worthwhile intiative. On 6 October 40-odd restaurants, cafe and bars in the city centre will be doing two-for-ones or other special offers and events. This includes venues such as Chutney Ivy (which will have Indian and English singers in for the night) Kayal, The Case, The Boot Room, Rutland and Derby and Cedars Lebenese which be hosting belly dancing. The precise offer varies so make sure you have a browse of the offical information (Click here). Given the depressing news this week about the failure to thrive of Market Corner, it would be good to have the city heaving with people enjoying their food. I went to Cedars not long after it opened a couple of years back in the, well, lively, location of Churchgate in Leicester. It was a pleasure to welcome a Lebenese restaurant to the city but I found it a bit hit and miss – some of it very pleasant, some of it just not to my taste, in particular a preponderance of sharp, vinegary flavours. Service and presentation also misfired at times suggesting it hadn’t really settled down yet. But the restuarant has survived, and I was pleased to get a chance to revisit last weekend, though it’s perhaps unfair to judge a restaurant by how it performs when feeding a set menu to 30 hungry people celebrating a birthday early on a Sunday evening. With that in mind, I’ll say straight up that while the food we had wasn’t outstanding, it was certainly consistently good and in the main gave the impression of being cooked with care and presented with pride. We were provided with a wide variety of hot and cold meze to start. Kibiss pickles are too sharp for me, but pretty much everything else went down well – neatly trimmed chicken wings were nicely grilled and served with some delicious aioli, hummus was fine, the lamb sambousek (little pastry parcels) were tasty though the pastry could have been lighter. The stuffed vines leaves were good, the falafel very good, while the tabouleh was full of very fresh parsely and a zingy dressing. Vegetarian mains were basically variations of veg stews with rice and opinions seemed to vary from ok to very good. Carnivores were able to get stuck in to a variety of marinated grilled lamb and chicken with fries. The Lebenese house red was very quaffable , while service was swift and helpful. All in all, they did a very job for us, and I am more inclined to revisit now on a calmer evening (which means probably not one of their regular belly dancing evenings) to see what they can do. Haut cuisine it ain’t, but possibly more importantly it does seem a likeable place offering honest, robust Eastern Mediterranean food.